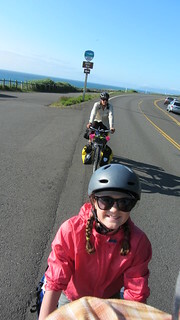 Following is a series of posts about our 2012 two-tandem-family Pacific Coast bike tour. Our family of four (mom, dad, an 11 year old and a 9 year old) pedaled two tandems from our house in North Seattle and ended up in San Francisco three weeks later. Of course there’s more to the story than that, and if you want to know more, read on! Note: In summer 2013, we’ll complete the route, picking up where we left off in San Francisco and riding to the Mexican border. We originally planned to ride directly from our house in Seattle and end up in San Francisco, CA at the end of 3 weeks. However, plans don’t always work out. Many setbacks delayed our departure ( lots of rain, some mechanical issues and family stuff). Instead of pedaling to Portland, we ended up taking the bus. I already wrote about the first day in a previous post so I won’t repeat it here. But if you’re curious, clink the link and read the funny first day story. Ahh, Portland. The bicycle mecca. We have lots of friends here and love to visit when we can. It’s such a great place to ride bikes and eat delicious food! When we travel to Portland, we usually stay with Vincent and Jennifer: great friends and gracious hosts! (and of course the wine, is an added bonus.) Vincent and Jennifer never fail to make us feel welcome in their home! I can’t really call day two a rest day. Other than the 5 mile ride from our house to downtown Seattle the previous day, we hadn’t actually done any riding. Day two featured relaxing, last minute grocery shopping and a mini-tour to stretch our legs and check out Portland’s Fourth of July happenings. We also stopped at REI in the Pearl District to buy a travel pillow for Tim. After the quick tour of Portland, we pedaled back to Vincent and Jennifer’s for a Fourth of July BBQ, neighborhood fireworks display and to prep for the following day’s departure. Low: The boy gathered up all of the spent fireworks from the neighborhood fireworks display. He was crushed when we told him he couldn’t bring them with us on the bike. High: Food, fun and good friends! If you’ve been reading our blog for any amount of time, you’re probably not surprised that we got a late start leaving Portland. To all of you non-early bird types out there, I’m happy to report that you don’t have to be an early riser to be a bike tourist. Thankfully NW summers feature long days and many daylight hours for riding. You can sleep in on occasion and still make it to the campsite by dusk. We packed up our gear and rolled out of NE Portland later than we had planned even by our standards, but happy we were finally pedaling toward our goal. Our friend, Mitch, met us on the Klickitat Greenway and rode to the Lloyd Center MAX station to see us off. So fun to ride with him and his daughter and to get a personal sendoff! Our plan to ride MAX to Hillsboro to avoid big hills and 18 miles of suburb riding quickly evaporated as we arrived at the Lloyd Center MAX station and encountered a series of full trains. Portland friends had warned us that large bikes aren’t technically allowed on MAX since they don’t fit in the designated bike area. Since the worst possible outcome was getting kicked off, we thought we’d try to board any way. Our hopes of squeezing two giant fully loaded tandems on the trains packed with Fourth of July weekend revelers diminished with each passing train. As the minutes ticked by, we began to picture ourselves in a motel on the outskirts of Portland instead of camping at the base of the Nestucca Valley climb. We eventually gave up on MAX and decided to ride to Hillsboro instead. We pedaled downtown and began the big climb out of West Portland. Just past the last Portland MAX stop near Jefferrson station, we were passed by a nearly empty Blue line MAX train. That empty car gave us pause, should we try again? On a whim, we decided to wait for the next train and test our luck. The next train was empty so we jumped on and let MAX whisk us off to Hillsboro, shaving at least 2 hours off our first day of riding and allowing us to arrive in McMinnville just before dinner. Dirty rotten cheaters? We say, no! We stayed at Hotel Oregon, a McMenamins hotel in McMinnville. After a restful sleep, and a hot breakfast we packed up and left the hotel earlier than normal for us. Yay! On the road before lunch! We cherish the little victories. Todd had recommended a route that followed the lovely Nestucca River Valley out to the Coast. He warned us about the big climbs on this route so we were prepared to suffer. The kids surprised us with their tenacity and didn’t complain much as we pedaled all day uphill in the heat. It was super slow going, at one point my bike computer said I was only going 2.5 miles an hour. You can barely keep a bike upright at that speed, it would have been faster to walk! But the road was relatively traffic free and even though the climbs long and steep, we enjoyed the pleasant and scenic ride. Fourth of July weekend meant full campgrounds along the Nestucca River so we decided to go all the way to Pacific City and test our luck there. Julian had kept in touch all week and said he might head out on a camping road trip with the kids and meet up with us. We texted a few times throughout the day and kept in touch about our whereabouts so he’d know where to meet us. As we emerged from the cellular dead zone on the Nestucca River, we confirmed with Julian that we’d meet him in Pacific City. We reported the full campground situation and sent him off to test his luck with another camper. After a delicious dinner and a couple of much earned beers, we pedaled back to the campground for some rest. We were happy to see Julian’s car and tent set up right next to ours. High: Julian and the kids drove down and met us in Pacific City! Sleep: Woods County Campground. Friendly vanagon guy agreed to split his campsite with us. The next morning we awoke to kids laughing and playing outside the tent. We rolled out of bed and fired up the coffee. Julian said he planned to stay another night and agreed to drive ahead to Beverly Beach and get a campsite we could all share. The ride was enjoyable and beautiful, with quintessential Oregon Coast vistas all day long. We even made pretty good time, despite our lack of training! Just North of Lincoln City, the Adventure cycling map listed a cutoff that detoured off the Hwy 101. Anytime you can ride off Hwy, do it! Just as we turned onto Slab Creek Road off Hwy 101, we saw a spray painted sign on a piece of particle board that said the road was closed 4 miles ahead and something like, “No way through on bikes” Tim was sure the sign meant motorcycles and that surely we could pass whatever the issue could have been on bicycles. So we decided to ride the 4 miles uphill to see if we could get through. 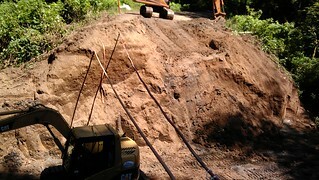 We didn’t expect to find a chasm and impassable washout! There was no way to lug 2 fully loaded tandems down into the pit and back up again on the other side. We reluctantly headed back down to the Hwy 101. What followed was the scariest ride of my life. A non-existent shoulder, a concrete barrier that didn’t allow much room to maneuver in the lane, speeding cars, winding hair pin turns with lots of blind corners. All of it combined for the worst stretch of Hwy on the trip. I steeled myself to get it over with and pedaled like I’ve never pedaled before. The boy and I rode away from Tim and the girl, they couldn’t catch us no matter how hard they tried. I was riding on pure adrenaline and there was no way I was slowing down to wait. We survived that section of highway but I think I lost some years of my life from the stress. The rest of the day was uneventful and pleasant. We arrived at Beverly Beach and were greeted by Julian and the kids, a nice campsite by the river, beer, corn on the cob, steak and Julian’s signature swirly dogs for the kids! What a nice surprise. 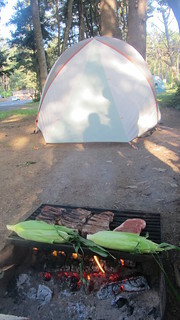 High: Julian hosted our nights camping complete with steaks, corn on the fire and beers! Note about climbing stats: Tim used a Google GPS app to track daily mileage and climbs. Looking at them now, the numbers seem high and should probably be verified. This entry was posted in bike touring, bikes, Pacific Coast Bike Tour and tagged 2012, carfreedays, family bike touring, Family Cycling, kids, OR, Pacific Coast Bike Tour, Portland to Beverly Beach, tandem, tandem bike tour. Bookmark the permalink.